View of Amborep village – Photo taken by Gerard Zegwaard. [Copyright Stichting Papua Erfgoed]. 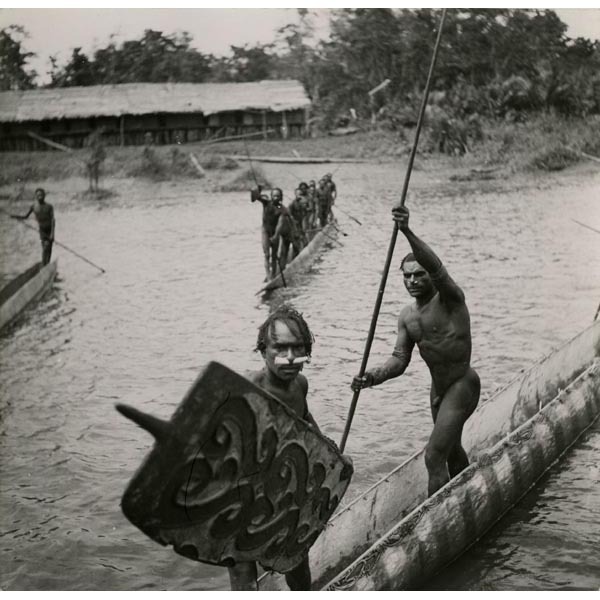 Papuans on the Lorentz River in Western New Guinea during the third South-New-Guinea expedition of 1912-13 [Copyright: Tropenmuseum]. Bis poles on scaffolding [Copyright: Passage To Art]. A man in Amborep carving a bis pole – Photo taken by Gerard Zegwaard. [Copyright Stichting Papua Erfgoed]. Father Zegwaard standing with the honored guests of a village celebration – Photo is part of Gerard Zegwaard’s personal collection. [Copyright Stichting Papua Erfgoed]. You can read more about the Tropenmuseum and their bispoles in this post. 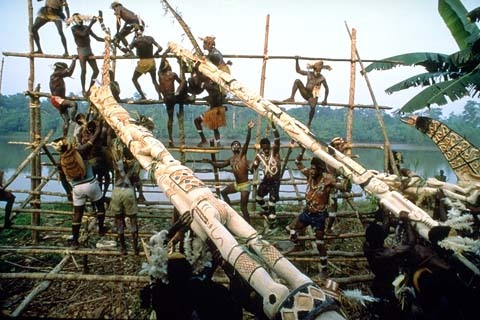 You can also read more about the colonial origins of Western ethnographic museums in this post. The Mission Museum in Steyl. Part of the Papua New Guinea display case in the Mission Museum. You can read more about the Mission Museum in Steyl in this post. I hope this gives you a better sense of the settings used in Rituals of the Dead. You can pick up my artifact mystery on Amazon COM, Audible US, Barnes & Noble, iBooks, or your favorite online bookstore. Click here for more direct links. Happy reading!